Beautiful Blue Farmhouse Kitchens that Will Inspire You! What’s your favorite color Kitchen? No really…tell us in the comments so I can explore it for you! For me…I LOVE Blue no matter what the Hue. So I thought I would go on the search for some Beautiful Blue Farmhouse Kitchens That Will Inspire You and Me : ) Each one is more fabulous than the other. I have to admit though that the first one is my favorite…it is what my Kitchen Dreams are made of! I sure hope you enjoying checking all of these Kitchens out. Blue might be for you or it might not…but one thing is for certain…I do believe you will have fun and walk away with some ideas or inspirations for your very own Kitchen. Remember to share your favorite Color Kitchen in the comments! This kitchen has to be one of my most favorites of all times. The is amazing cabinet color paired with a traditional white subway tile is perfection. A touch of copper is the perfect accent. The library style ladder not only adds to the charm and over all feel of the space…it is great for many of us that aren’t 6 foot tall : ) Oh yes…let’s not forget about those two little furry cuties…talk about stealing the show! Come on over to Ciao NewPort Beach and take a closer look at Julianne Hough’s Kitchen and Home…trust me you will fall in love! The soft blue cabinets are dreamy and the Black and Gold accents add a vintage industrial Farmhouse feel to the space. The open shelving makes the space feel even bigger than it is. A wonderful place to share family…friends and to cook that perfect meal. Check it out over at Addison’s Wonderland! How fabulous is this Navy Blue Kitchen Island? It’s the perfect POP of color for this Misty Gray Kitchen. Navy Blue can hold its own as a main color or it can be an amazing accent. Have you ever considered using 2 different color cabinets in your Kitchen? I just had to share this Blue finish on these cabinets. A Farmhouse Fantasy! Home Bunch shows what Mozart Blue with Black Glaze can look like and all I can say is YES PLEASE! Check out this whole kitchen…it’s pretty outstanding. Come and enjoy this beautiful Kitchen Makeover at Becki Owens place. Watch as the entire space is transformed to a Kitchen Paradise. The big take away here for me was how amazing brass hardware pairs with blue. Also…two toned cabinets truly is becoming a classic. This Slate Blue is absolutely gorgeous paired with tiny elegant silver knobs. 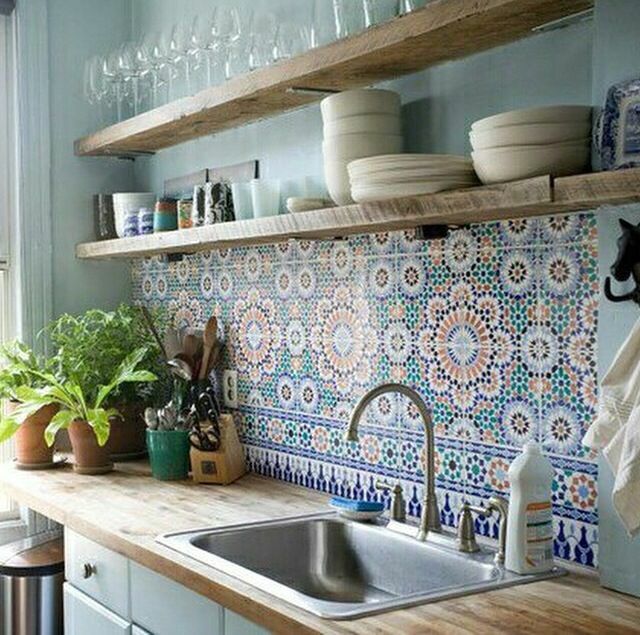 Once again Subway tiles pair perfectly with just about any cabinet and color. Hop on over to Home Bunch for more inspiration! Don’t you just love how a simple rug (the right rug 🙂 can elevate this beautiful Kitchen’s spirits! Then the you are looking for a change…just mix it up with a new rug. Once again you can not go wrong with White Subway Tiles! Head on over to Pure Wow! These soft beautiful Robins Egg Blue cabinets with brushed silver hardware is paired with an amazing tile floor that is very similar to the one that Joanna Gaines used in their new restaurant Magnolia Table. The look is clean and classic. Over at Style By Emily Henderson you will see an entire Kitchen transformation starring BLUE! I am really enjoying the POP of design she added with that fabulous floor. Drop by for some more innovative ideas. Emily shares all of her purchases too. The fabulous designer Sarah Richardson designed this beauty from scratch. She took this pale blue straight up to the top…added a marbleized floor and then the vintage wine tasting table was the finishing touch and what a wonderful one it is! This kitchen that I found on Pinterest (it does not have a direct link) but I had to include it in this collection. This lovely medium shade of blue is taken straight up to the top and then it is brought into the Roman Shades…the Stool Covers…even the Dishes and Knobs to the Stove! A perfectly coordinated Kitchen with a Contemporary Farmhouse Style. Simple Shaker Style cabinets with shiplap and open shelving gives a very traditional Old School Farmhouse Vibe with a fresh blue face. What would make a blue Kitchen even more fantastic…a gorgeous backsplash with shades of blue and contrasting colors like this masterpiece. I will quickly become a focal point of the space. So if you are going to live on the Decorator’s Edge…maybe step out of the backsplash box and explore something new…you will be pleasantly surprised! This Traditional Farmhouse kitchen includes beautiful cabinetry …traditional hardware…delft style backsplash and dramatic black counter tops which just add to the drama of the space. Rich hardwood floors are the finishing touches. This gorgeous deep blue kitchen with this incredible Copper Sink looks like it could be one of Joanna Gaines recent Fixer Upper Creations but guess where it is from? The set of Downton Abbey! Who knew the Farmhouse Vibe was a live and well in 1912??? Loving Chip Wade’s gorgeous Kitchen over at HGTV. The Wooden backsplash is simply stunning! Sure hope you enjoyed this Collection of Beautiful Blue Farmhouse Kitchens…remember to leave your favorite color in the comments so we can make you your very own collection! « Farmhouse Thrift Store Makeovers You Will Fall For! The blue kitchens were lovely. My favorite is red and white with black accents. Always inspired by your blog. I do love blue, but I haven’t had the nerve yet to paint my cabinets it. They are creamy white, but my galley kitchen has Blue Willow dishes in open shelves, blue toile curtains, a blue stand mixer, and a blue door to the outside. All of these are so gorgeous! Thanks for sharing, Andrea!